BISSAU (Reuters)- - Heavy weapons fire echoed through the capital of Guinea-Bissau on Thursday, witnesses said, and soldiers surrounded the residence of former Prime Minister Carlos Gomes Junior, the frontrunner in a presidential election in the small West African state. The reason for the military action and Gomes Junior's whereabouts were not immediately known. Armed soldiers stopped journalists from approaching the residence, which is located almost opposite the Angolan embassy in the capital Bissau. Witnesses said the firing later subsided. Guinea-Bissau has not been your most stable African countries and has a long history of coups. The West African regional bloc known as ECOWAS said it “formally condemns any attempt at a coup d’etat,” said Daniel Kablan Duncan, president of the body’s Council on Mediation and Security. The violence comes just weeks before the country’s presidential runoff vote, which Prime Minister Carlos Gomes Jr. was favored to win. There have been fears of a coup ever since Guinea-Bissau’s president died of complications from diabetes in January, leaving an interim leader in charge of the chronically unstable country known for cocaine trafficking. "If Gaddafi asks to come to Guinea Bissau we will welcome him with open arms and we will ensure his security,"
"Gaddafi and Libya are friends of Guinea Bissau. If the Libyan leader wants to come to Guinea Bissau we will receive him with open arms." 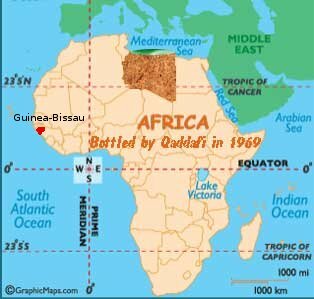 Guinea-Bissau is not a member of the International Criminal Court and so Qaddafi would have been beyond the court's reach there. The west African nation had strong ties with Gaddafi's regime, which invested widely in hotels, agriculture and cashew nuts - the country's main export. Gaddafi visited the country in 2009, and provided support to the presidential campaign of President Malam Bacai Sanha. He has also provided uniforms to the Bissau Guinea army and renovated several of its military barracks. 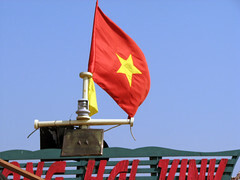 This coup d’etat is only hours old as I write this and it is far to early for me to have an opinion as to who these actors are or what are their motivations. I also know little about the Guinea-Bissau Qaddafi connection, but at first Google there is one and a very strong one at that. Already we can see he was involved with both the civilian politicians and the military, buying uniform, building barracks, and now the military has overthrown the president. However is does fit the pattern of much needed political upheaval, I expected in Africa if Mummar Qaddafi were overthrown. What has surprised me most is how rapidly these have been coming. It is already clear that Qaddafi had his fingers deep into little Guinea-Bissau, so watch this diary for updates on the situation in Guinea-Bissau and we'll see what happens next. People flex power in three African Countries. Occupy Nigeria - 1st African fruits of Qaddafi gone?